Tom Rawlings (center), director of Georgia’s Division of Family and Children Services. The agency has a goal of soon placing half of foster youth with relatives. Photo courtesy of DFCS. 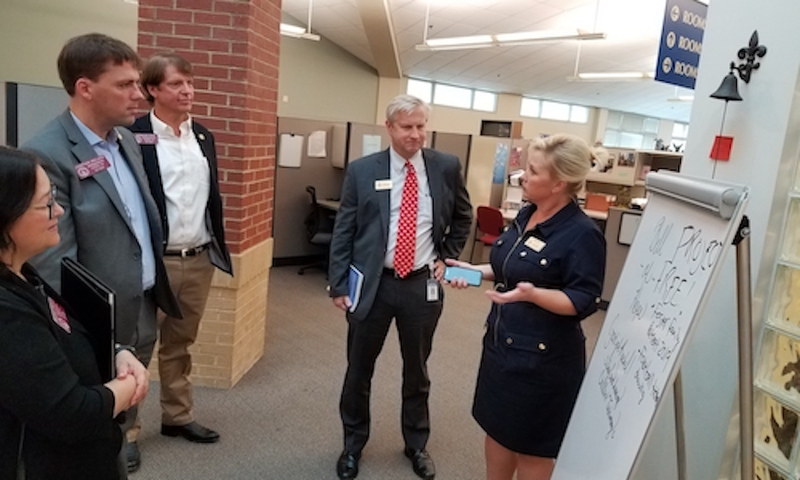 When Tom Rawlings took over as director of Georgia’s Division of Family and Children Services (DFCS) in July, he knew the agency was experiencing turbulence. Rawlings is the third person to have that job in less than a year — turnover is not unusual for sprawling child welfare agencies like Georgia’s — but the former director of DFCS’s watchdog office might be well-positioned to deal with growing pressure on a top concern: the ballooning number of children entering foster care, which has nearly doubled since 2012 to reach more than 14,000 children. “If you’re a social worker and you’re concerned about the child’s safety, which is our number one priority, the easiest way to keep the child safe is to take the child into foster care, and I think that’s what we experienced,” Rawlings said. Georgia’s child welfare system is at the high point of a pendulum that has swung from high numbers of children to low and back again over the last 15 years. As numbers reach another high point, Rawlings is now adjusting DFCS policy to reach the agency’s goal of keeping children safe, while preventing them from being unnecessarily taken from their families. DFCS has increased the number of foster homes in Georgia, but that pace is dwarfed by rising removals of children from their homes — and challenged by a spreading opioid epidemic. A growing reliance on relatives who take in the children of kin after child protection gets involved has helped prevent a challenging situation from becoming a full-on crisis. But policymakers in the state are concerned that Georgia needs to do more to help support those placements. The last time foster care numbers were this high was around 2004, when totals surged past 14,000, according to DFCS data. Then, the agency implemented strategies like diversion — where investigators assessed reports of potential abuse and sometimes referred parents for voluntary services instead of formally investigating them — which contributed to a precipitous decline in the number of children in foster care, halving it in six years to fewer than 7,000 youth. Foster care numbers stayed low until 2013, when, in the wake of two shocking deaths of children – Emani Moss and Eric Forbes – who both had histories with DFCS, Governor Nathan Deal (R) ordered DFCS to undo the “indoctrination” of caseworkers that he said had focused on keeping children with their families at the expense of child safety. 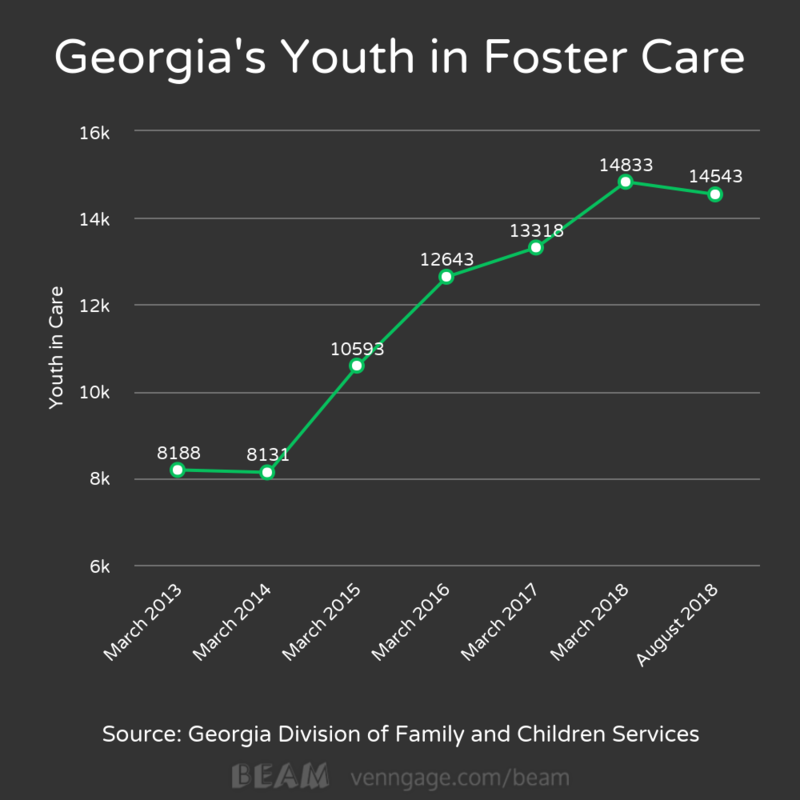 The latest increase of children in Georgia’s foster care system also has to do with the way the system operates. In 2013, DFCS centralized its child abuse intake, which had previously been a network of local offices, and created a new, single hotline that was widely marketed. Shortly after, child abuse reports started going up — and fast. Like other government agencies, DFCS’s budget was slashed by 30 percent following the Great Recession, and the agency had lost 750 of its case workers within five years. At that time, Georgia’s foster care numbers were at a low point. Rawlings said that when the number of children in foster care began to increase in 2013, the agency saw the need to staff up. “But that means that the workforce that we have today is not as experienced as what we had, say, 15 or 20 years ago,” he said. Brett Hillesheim is a spokesperson for UMC Children’s Home, one of the largest private child placing agencies in Georgia. He says the Children’s Home is seeing reports of abuse investigated faster, which also means faster removals, straining his agency’s capacity to take them in. A lack of available foster homes also means that children are being placed further from their communities, sometimes hours away from their families, schools and support systems. Melissa Carter, Barton Child Law and Policy Center: After years of rising foster care numbers, “there’s some concern that we overcorrected.” Photo by Sonam Vashi. “Whenever you have a foster care shortage, as we do, then what happens in reality is that the case managers who are placing that child are going to find the first home they can,” Rawlings said, adding that DFCS is now focusing on increasing the number of available homes within 50 miles of a child’s home county. For families impacted by substance abuse, the state is also still trying to determine the right benchmarks to help decide when to remove a child from a home or not, Hillesheim said. A recent federal overhaul of child welfare funding passed in February, called the Family First Prevention Services Act, aims in part to help funnel more funds to states to provide substance abuse services without a formal foster care removal. To respond to the foster care increase and the lack of available homes, Rawlings said that, when children need to be removed from homes, his agency is focusing on placing more children with blood relatives. Currently, about 30 percent of children are placed with a relative each month, which is below Georgia’s goal of 50 percent but mirrors the national average. Rawlings said that DFCS has started a pilot program which, before a child is removed from a home, convenes a special team with the Office of the Child Advocate and local staff to make sure that removal is truly the best choice for a child. In nearly half of those cases, Rawlings said, DFCS has chosen to place the child with a relative or get the family supportive housing or health services instead. State Rep. Mary Margaret Oliver (D), a longtime child welfare advocate, says that legislative aid for Georgia’s foster care system is up in the air until the next governor is elected, noting that Democratic candidate Stacey Abrams has a history and focus on child welfare. But Oliver does hope to see proposals for more financial support for the relative who takes in a child. Carter said that the Family First Prevention Services Act, the federal overhaul, may offer steadier guidance for Georgia as its system swings from one policy to another. Sonam Vashi is a freelance reporter based in Atlanta.